Swedish and Norwegian mobile users could be among the first to use a fourth-generation (4G) mobile network. Mobile phone firm TeliaSonera has completed work on two 4G networks in Oslo and Stockholm. The company said that the first customers will be able to start using the networks in early 2010. Despite the launch of the network, no handsets can yet use 4G. Initially customers will connect via a dongle and a laptop. Fourth-generation, 4G, networks are based around the Long Term Evolution (LTE) technology and downlink data speeds can hit 100 megabits per second - about ten times quicker than the fastest 3G networks. The technology has been designed to overlay existing 3G networks and most operators have committed to upgrading to the faster system. TeliaSonera said it was recruiting customers to pilot the network during the first quarter of 2010. It has released no information about the cost of connecting to the high-speed network. 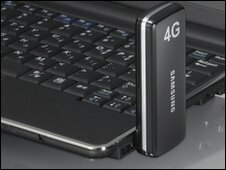 The dongles for connecting to the LTE network are made by Samsung. Phone equipment maker Ericsson has put together the network in Stockholm, Sweden and Chinese firm Huawei is behind the one in Oslo, Norway. Both networks cover the central regions of both cities. TeliaSonera said it expected the boost in speed to drive many novel applications including gaming on the move and much greater viewing of video on laptops. Handsets that can use LTE are expected in mid-late 2010.